La Liga has rejected an attempt by lawyers for Barcelona forward Neymar to pay his buyout clause of 222m euros (£198m). 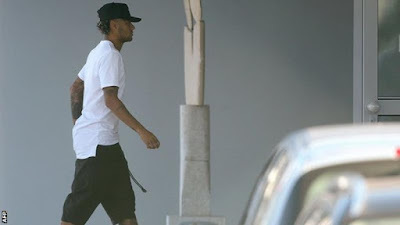 The Brazilian, 25, is expected to sign for Paris St-Germain for a world record fee, after telling Barcelona he wanted to leave the club on Wednesday. Spanish media say La Liga officials believe PSG are violating Uefa's Financial Fair Play (FFP) rules. Barcelona previously said they would report PSG to Uefa for a FFP breach. In Spain a player must buy himself out of his contract. This is done by depositing the amount of the buyout clause with La Liga - Spain's equivalent of the Premier League - to release the player from his contract. The league then passes the money to the selling club. "We can confirm that the lawyers of the player have come to La Liga to deposit the clause and that it has been rejected," La Liga Said. PSG are backed by money from Gulf state Qatar and La Liga president Javier Tebas has accused the French club of "financial doping". He told AS: "La Liga is positing that state-backed clubs that compete using 'financial doping' could destabilise professional football in Europe".